IBM Guardium prevents leaks from databases, data warehouses and Big Data environments such as Hadoop, ensures the integrity of information and automates compliance controls across heterogeneous environments. It protects structured and unstructured data in databases, big data environments and file systems against threats and ensures compliance. It provides a scalable platform that enables continuous monitoring of structured and unstructured data traffic as well as enforcement of policies for sensitive data access enterprise-wide. A secure, centralized audit repository combined with an integrated workflow automation platform streamlines compliance validation activities across a wide variety of mandates. It leverages integration with IT management and other security management solutions to provide comprehensive data protection across the enterprise. They are intended to enable continuous monitoring of heterogeneous database and document-sharing infrastructures, as well as enforcement of your policies for sensitive data access across the enterprise, utilizing a scalable platform. A centralized audit repository designed to maximize security, combined with an integrated compliance workflow automation application, enables the products to streamline compliance validation activities across a wide variety of mandates. IBM Security Guardium for Applications – GFA masks sensitive data in web applications dynamically without changing the web applications themselves. IBM Security Guardium File Activity Monitoring (FAM) – Use Guardium file activity monitoring to extend monitoring capabilities to file servers. 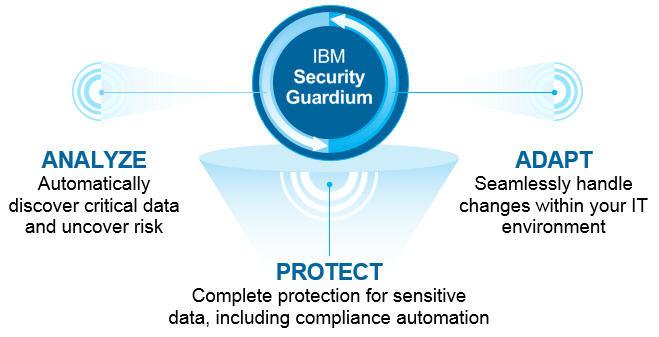 The IBM Guardium products provide a simple, robust solution for preventing data leaks from databases and files, helping to ensure the integrity of information in the data center and automating compliance controls. Automate the entire compliance auditing process, including creating and distributing reports as well as capturing comments and signatures. The Guardium solution is designed for ease of use and scalability. It can be configured for a single database or thousands of heterogeneous databases located across the enterprise. This solution is available as preconfigured appliances shipped by IBM® or as software appliances installed on your platform. Optional features can easily be added to your system after installation.